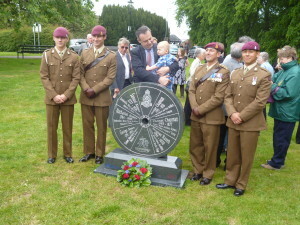 Amongst the many remarkable commemorative events of 2015, around 250 people gathered at St Simon and St Jude parish church in Earl Shilton, Leicestershire on Sunday 14th June. 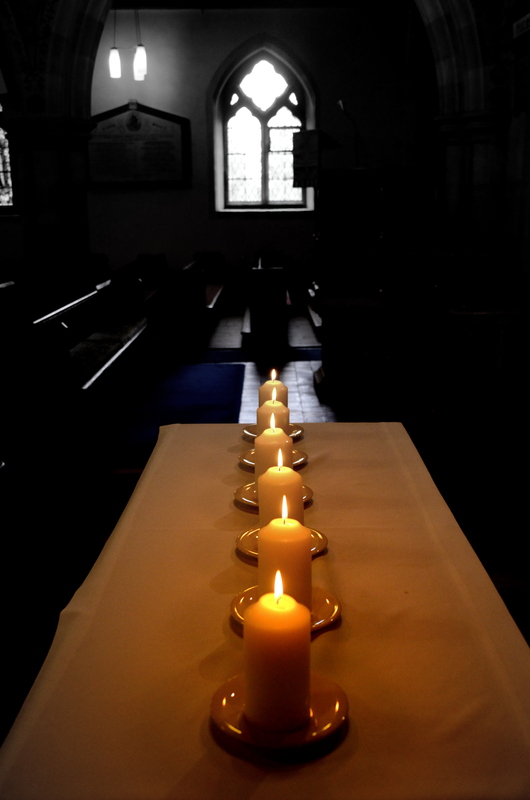 During the service six young children, all descendants of the Almey and Raven families, lit six candles in memory of Earl Shilton’s six Waterloo heroes. 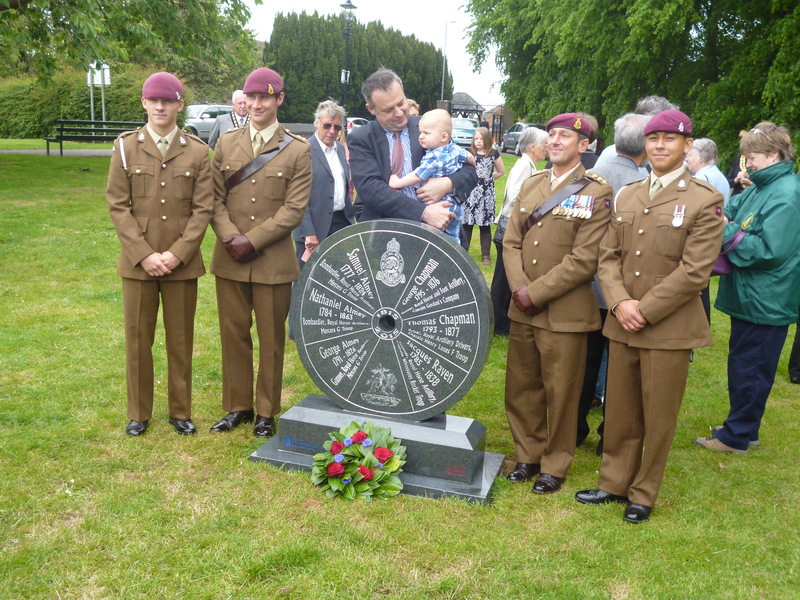 Following the service the congregation walked a short distance to the adjacent Hall Field, to witness the unveiling of the new commemorative stone in the shape of a gun carriage wheel, unveiled by Captain Rob Maynard of today’s G Battery RHA of the Parachute Regiment. The same evening Mandy Chesterton (descendant of Nathaniel Almey) and Paul Seaton of the Earl Shilton Historical Group appeared in Sean Bean’s Waterloo on the History Channel for a brief 60 seconds of fame as a Waterloo cannon being fired. 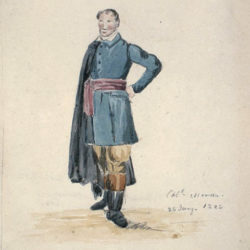 Much of the information used during filming was taken from Alexander Cavalie Mercer’s book The Journal of the Waterloo Campaign, and within the 1815 ranks of G Troop Royal Horse Artillery were the three Almeys from Earl Shilton. Filming also witnessed the firing of replica Congreve rockets, a reminder that Jacques Raven from Earl Shilton was a Gunner in Whinyates Rocket Troop at Waterloo. 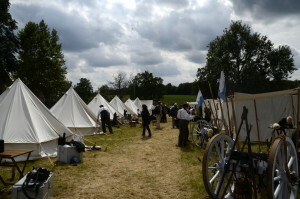 Images of the event can be seen here. After a great day in Earl Shilton it was time for the Seaton family to head to Belgium. 18th June saw us visiting the beautiful old town of Ghent, which would have been very similar in appearance two hundred years ago, when G Troop stayed for a week and on one day provided a guard of honour for King Louis. On 19th June Brussels witnessed the Waterloo Dispatch, the message sent by Wellington back to England declaring victory. Amidst plenty of champagne the current Prince Blucher gave a short speech about his illustrious ancestor of 1815 and finished with a nice play on words, ” Europe should move forwards” a direct reference to his ancestor whose nickname was “Forwards”. Saturday 20th June we spent the whole day at Waterloo, visiting the newly refurbished Mercer/G Troop monument. It makes you realise how close to Hougoumont G Troop were on the day of the battle. We visited the bivouac of the 95th Rifles/RHA re-enactors group and climbed the Lion Mound. What great views you get from the top and a better appreciation of how small the battlefield at Waterloo truly was. An interview for the Hinckley Times resulted in a two page spread which you can read here. We then watched many of the soldiers marching towards the battlefield as we headed towards the stands for the Allied counter attack re-enactment. It was slow progress with 60,000 spectators going the same way! 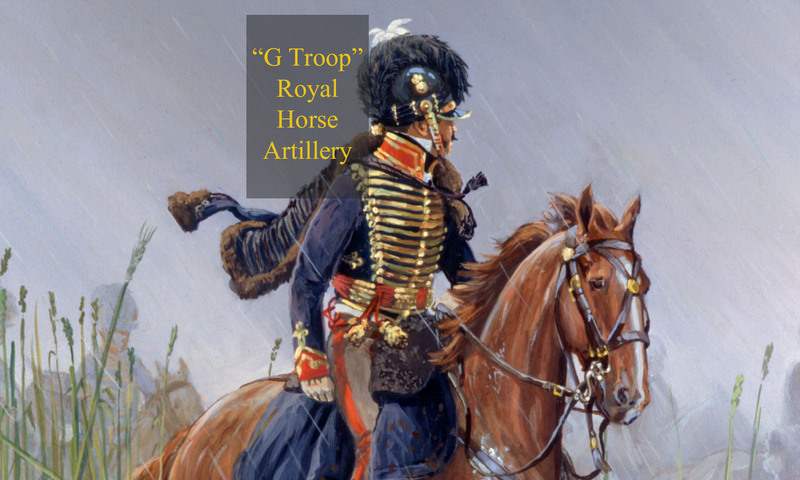 The artillery fire began the evenings proceedings, it soon became apparent to all attending that smoke at the Battle of Waterloo was a very big issue! It certainly confirms Mercer’s notes as being very accurate on this aspect of the battle. 6,000 re-enactors on a battlefield certainly makes a splendid sight, I particularly enjoyed watching the deliberate slow advance of the French Infantry, just as it would have been on that day. My daughter Sarah took many images throughout the day and they are available to view here. 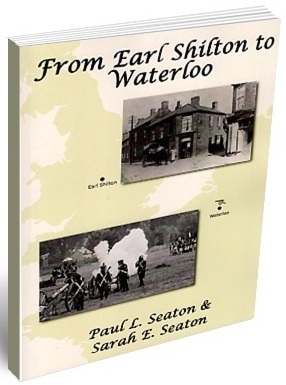 The Earl Shilton Historical Group have produced a book and CD oral history recording, both priced at £5.00 each, and both entitled From Earl Shilton to Waterloo. Please contact paul.lseaton@gmail.com for more information.